Broken or cracked window glass should be replaced to keep your home secure from insects and weatherproof. You will need to be cautious as you remove the old glass to avoid injury. 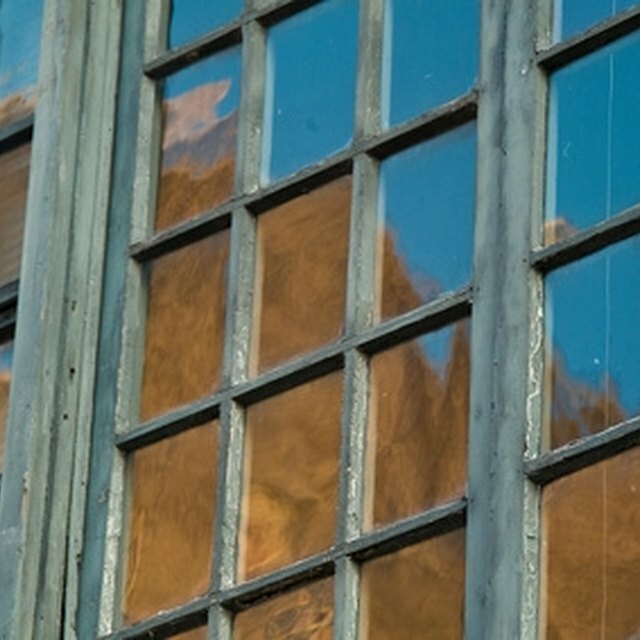 You should check with a window repair professional if you are uncertain about how to replace the glass yourself. You may need a friend to help when you remove and reinstall your window, especially if the window is heavy. Window glass can shatter if you are not careful. Take the window from its jambs, which are the sides of the frame hugging your window. If you cannot remove the window glass, use a heat gun to soften the glazing holding the glass in place. You should be able to remove the glazing by scraping at it with a knife. Next, remove the metal glazier's points and the window glass if it has not yet been removed. Take measurements of the window frame opening and take them to your local hardware or home repair store. The replacement window glass you purchase should be 1/4" shorter than the measurements you took in all directions. Clean and sand the wood where the glass will be installed into the frame, cleaning and sanding into the grooves. Remove old paint and putty left behind by the old window. Coat the wood with sealer and allow it to dry. The bottom edge of the window frame should be coated with a thin layer of glazing compound, as the glazing compound will fasten the window glass to the frame. Install your glass panel and press it gently into place around the edges of the frame. Put glazier's points back into place to secure the panel. Apply a thin layer of glazing compound around the edges of the glass. Use a wet finger to smooth the glazing compound into place. Allow the glazing to set before you repaint the window, allowing the paint to overlap 1/16" onto the glass. Reinstall the window. Never attempt to remove large windows by yourself. Consult a friend or a home repair professional. Placing masking tape in rows along a glass panel can prevent it from breaking while you transport it. "Ten Pound Books : Home Repair Guide" ; Creative Publishing International, Inc. ; 2007.